Evan S. Borenstein represents public and private companies, funds, governmental entities, family offices and high-net-worth individuals on a wide variety of transactional matters and corporate and finance transactions. 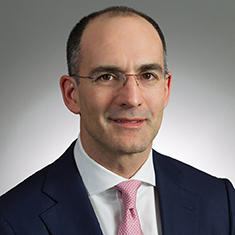 He focuses on mergers and acquisitions, credit facilities and term loan financings, secured and structured financings, corporate reorganizations and restructurings (including out-of-court restructurings and Chapter 11 bankruptcy proceedings), and private equity and venture capital transactions. He also advises companies and investors on general corporate matters. Evan regularly assists entrepreneurs, start-ups, sponsors and funds in various investing activities. These investments include mezzanine debt, convertible securities and preferred and common equity, and can take the form of minority investments or acquisitions of entire enterprises. Evan's practice also involves serving as outside general counsel for a number of his private clients, advising on a broad range of matters, including commercial contracts, corporate governance, growth initiatives and capital raising. He represents clients in a variety of industries, including the technology, transportation, energy, manufacturing, retail, real estate, financial services and industrial sectors. Evan also is well-versed in cross-border transactions and works with clients and their counterparties in various international jurisdictions. Shown below is a selection of Evan’s engagements. Representation of coal company in $1.2 billion strategic merger. Representation of private equity buyer in $70 million acquisition of controlling interest in phone accessory distributor. Representation of private equity buyer in $1.3 billion acquisition and subsequent disposition of interest in telecommunications company. Representation of contract electronics manufacturer in $4.8 billion strategic merger transaction. Representation of telecommunications technology company in $780 million spin-off transaction and $80 million sale of subsidiary. Representation of sellers in $2 billion disposition of dietary supplement foods manufacturer. Representation of selling shareholders in $75 million sale of controlling interest in oilfield services company. Representation of private equity sellers in $150 million sale of electrical equipment manufacturer. Representation of borrower in $2.1 billion syndicated revolving credit and term facility, $1 billion senior notes issuance, and $1.7 billion syndicated term loan acquisition financing facility. Representation of borrower in $600 million syndicated term loan facility. Representation of borrower in $650 million syndicated term and revolving loan acquisition financing facility. Representation of originator in $700 million trade receivables securitization and $300 million global trade receivables securitization. Representation of numerous originators in bilateral receivables purchase agreements and factoring transactions. Representation of industrial manufacturer in out-of-court restructuring and new senior secured credit facilities. Representation of media company in debt for equity swap implemented through a pre-packaged bankruptcy proceeding and subsequent sale of the company through a series of strategic asset sales. Representation of coal company debtor in debtor-in-possession financing and recapitalization transaction. Representation of private equity buyer in liquidating agency transactions. Representation of senior lender in exit credit facilities in connection with merger of airlines and upon emergence from chapter 11. Representation of indenture trustee in chapter 11 and out-of-court restructuring transactions. Representation of acquiror of refining assets from a chapter 11 debtor in a 363 asset purchase transaction.